Editor's Note: In a newer story, NASA officials discuss the possibility of the end to the rover mission. The surface of Mars is now obscured by a globe-engulfing veil of dust, posing a potentially longer-lasting threat to NASA's twin surface rovers. Massive regional storms have been whipping up dust on the red planet since late June. Now, they've combined to create a "planet-encircling veil of dust," according to a statement from Malin Space Science Systems (MSSS), which operates a camera on the Mars Reconnaissance Orbiter for NASA. "The dust raised by these individual storms has obscured most of the planet over the past few weeks," the release stated. 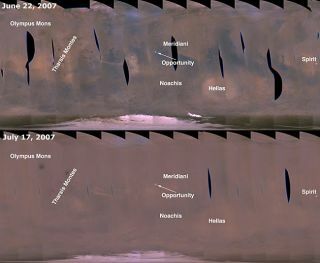 A series of images shows how the regional storms, which covered about 10 million square miles (25.9 million square kilometers) two weeks ago, have lifted enough dust to blot out the surface of the red planet. The Mars rovers Spirit and Opportunity weathered the regional storms by cutting back their activity, but the global dust event may escalate danger to the rovers that depend on sunlight to survive the bone-chilling cold of the planet. Steve Squyres of Cornell University, who is the lead scientist of the Mars Exploration Rover Project, said earlier this week that the dust levels are some of the worst the rover team has seen. "To give you a sense of the 'thickness' of the dust, the brightness of the sun as viewed from the surface is now down to less than 5 percent of what it would be with a perfectly transparent atmosphere," Squyres told SPACE.com. "Of course, Mars never has a perfectly transparent atmosphere, but the sun is still very faint." The saving grace for the rovers, however, is that the dust creates a glow of indirect sunlight. The effect is similar to Earth's cloudy weather, which blocks the sun but does not completely prevent light from reaching the ground. "Even if it's cloudy enough that the sun is obscured completely, it's not pitch black out," Squyres said. "The sunlight gets scattered through the clouds. Same thing with the dust clouds on Mars." Despite the trickle of sunlight, the thick haze of red dust is gobbling up most of the rovers' solar power, Squyres said. As of Monday Spirit and Opportunity were "both actively doing science" near their respective sites at Gusev Crater and Meridiani Planum, but are now in an energy-conserving "sleep" mode. "Rather than doing science, we're focused right now on conserving power and waiting for conditions to improve," Squyres said. If the rovers expend too much energy, they may be unable to warm their electronics and prevent circuit-snapping temperatures. "One side benefit of the high winds that have caused this dust storm is that they have done a wonderful job of removing dust from the solar arrays on both rovers," he said, going so far as to say that Opportunity's solar panels are cleaner than they were just months after landing in 2004. Still, Squyres noted that energy collected by the rovers' solar panels is about one-third of the level the first generated, so their activity is limited—and may be limited for months. Mars mission specialists have said the storms, first reported by SPACE.com, could become the worst since Mars was entirely enshrouded by dust in January of 2001. But the science of predicting martian weather is in its infancy, so uncertainty has been the only constant these past several weeks. "As with previous large dust-raising events on Mars, once the active storms die down, many weeks to months will pass before the dust settles out and the atmosphere clears," the Malin scientists said in their latest assessment.